Jack is five and, like any little boy, excited at the prospect of presents and cake. He’s looking forward to telling his friends it’s his birthday, too. But although Jack is a normal child in many ways - loving, funny, bright, full of energy and questions - his upbringing is far from ordinary. Jack’s entire life has been spent in a single room that measures just 12 feet by 12 feet. As far as he’s concerned, Room is the entire world. Told in Jack’s voice, Room is the story of a mother’s love for her son, and of a young boy’s innocence. Unsentimental yet affecting, devastating yet uplifting, it promises to be the most talked about novel of 2010. If this story had been told by anyone else, I wouldn’t have read it. 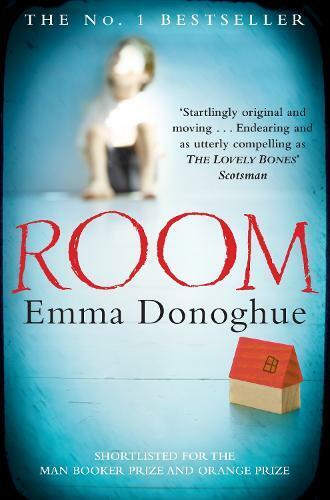 The premise of the novel is horrific, but once I started reading Room, I couldn’t put it down. I fell asleep thinking about it, and woke up itching to pick it up again. I read it on the tram to and from work, and attempted to read it as I walked home. I cursed Melbourne’s streetlights for being too far apart to comfortably read by while walking down the street. I was thrilled when I discovered Emma Donoghue had a new novel coming out. She is one of my favourite authors. She writes edgy historical novels and compelling contemporary fiction. Her historical fiction, such as Slammerkin, is loosely based on real events, reimagined to tell stories from a different perspective. In her volume of contemporary short stories, Touchy Subjects, ordinary characters in everyday situations are rendered fascinating through her wit and insight. Room is something else altogether. Room is narrated by Jack. He is energetic, bursting with curiosity, full of questions about the world, and excited by his fifth birthday. Yet you know something is not quite right in Jack’s world by the second sentence, when he mentions going to sleep ‘in Wardrobe’. Why is he sleeping in a wardrobe? What kind of five-year-old thinks that’s normal? Jack lives in ‘Room’ with his Ma, and knows nothing of the outside world. The objects in the 11-by-11-foot room they are locked in – Wardrobe, Door, Skylight – are almost characters in the story, because of the smallness of their world. With only his mother for company, Jack thinks of cartoon characters on TV as friends, because he has no concept of other children or real friends. His relationship with his Ma is intensified because they have only each other. In some sense, Room is not so different to Donoghue’s earlier historical novels, because it is inspired by real events, turned around and retold from a different perspective. Room is based on real women and their children, confined under horrible circumstances. But the perspective of this story makes it unique – it is not the sensationalistic story of a man holding a female victim hostage, but the story of a child and his mother in an incredibly difficult situation. Donoghue’s sensitivity and humour make this story not only readable, but beautiful and compelling. This would be a very different novel if it were told by Jack’s mother. The five-year-old acts as a buffer between the horrifying reality of her existence and the reader. We know what’s going on, but often Jack doesn’t grasp the meaning of the events he describes. This isn’t a fictionalised ‘survivor story’, but a story of the love between mother and child. Through Jack’s voice, we understand what he can’t – that his Ma would do anything for her son to get out of the room. The story of a mother, her son, a locked room and the outside world. Shortlisted for the Man Booker Prize 2010. Soon to be a major motion picture, directed by Lenny Abrahamson and starring William H. Macy and Brie Larson.